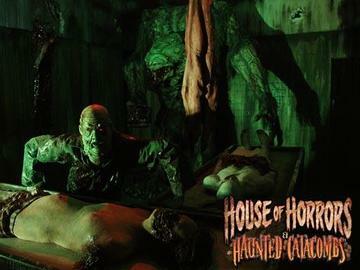 HOUSE OF HORRORS AND HAUNTED CATACOMBS Buffalo's #1 Halloween Event! Rated One Of The Top 10 Haunted Attractions In The US By USA TODAY! 11 Award Winning Haunted Attractions and Escape Rooms In One Monstrous Location! Event is recommended for adults and teenagers. Children under 10 should be accompanied by an adult - Carrying young children is NOT permitted. Please be advised that fog & stobe effects will be in use, as well as confined and dark spaces. Event is open rain or shine. Event reserves the right to remove patrons for any reason. ABSOLUTELY NO REFUNDS. ENTER AT YOUR OWN RISK.